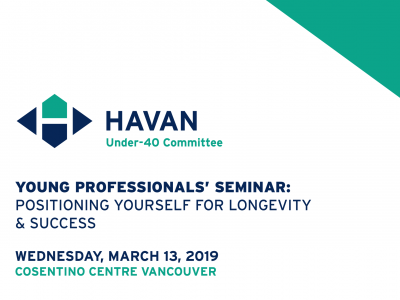 The U40 Committee returns the Young Professionals’ Seminar, with the new topic of “Positioning Yourself for Longevity & Success“ featuring a panel of 3 HAVAN members who will discuss their own unique career paths and lessons learned as they’ve navigated their businesses through economic ups and downs. Attendance is limited, so don’t hold off to register. Tickets are reserved for Under-40 HAVAN members. George Nickel is a founding partner and the director of business development at Innotech Windows + Doors, North America’s largest exclusive manufacturer of high-performance European window and door systems. In his impressive career, George has been involved in started two competing fenestration companies that have introduced and commercialized European-style windows and doors in the Pacific Northwest. George holds a Masters of Art in Leadership from Trinity Western University. Lynn has worked in the construction industry for over 20 years, holding senior management positions for several single-family and multi-family production builders. For the past seven years, as principal of Harrison Marketing Resources, she provides branding strategy and marketing expertise to builders and renovators throughout British Columbia. She has been actively involved in Greater Vancouver Home Builders Association since 1992, and continues to be heavily involved in all three levels of the association, including serving as President of CHBA-BC. Passionate about marketing in the homebuilding industry, she feels her biggest contribution is to understand how best to reach target markets, how to talk to them about their needs and how to build the value in using our professional members. John has a wealth of knowledge in the construction field and varied experience in all levels of the CHBA and the Better Business Bureau. John was the past Canadian Renovators Council Chair and have seen firsthand his ability to “go with the flow” and work on the issues at hand while keeping everyone engaged. He also sat on the CHBA National Executive in the postion of 2nd Vice President for three years. An active member of the homebuilders he has served as renovation chair at all 3 levels of the association, has served on all three levels of the Boards of Directors, is a GVHBA past president and serves on numerous committees aimed at forwarding the renovation and building industries. He is also past Chair and now serves on the Board of Governors of the Better Business Bureau of Mainland BC. John holds both the Certified Renovation Professional and Certified Housing Professional designations and is a licensed builder. He also holds the NAHB designations of Certified Green Builder, Certified Graduate Remodeler and Certified Aging in Place Specialist. John is also a member of the North Vancouver Chamber of Commerce and the National Kitchen and Bath Association. CCI Renovations is a past Best Residential Renovator of the Year in Vancouver – and has held the same title for the Province of BC for three consecutive years. CCI has also won for the prestigious Consumers Choice Award at the provincial level and numerous other association and home building awards. CCI Renovations is now in its 27th year of working out of North Vancouver. John has a solid commitment to the well being of his staff and is constantly helping them through education and an inclusive approach to management. This approach has earned the company a great reputation amongst its clients, suppliers, sub trades and even its competitors.